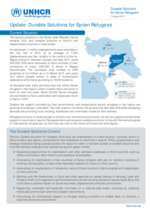 Durable solutions for refugees from Syria are based on a comprehensive protection and solutions strategy which seeks to: i) support host country and community resilience; ii) enable refugee self-reliance, including access to services, legal work opportunities and livelihoods; iii) expand access to resettlement in third countries and other complementary pathways, and; iv) plan for the return of refugees to Syria, on a voluntary basis, when conditions for a safe, dignified and sustainable return are in place. 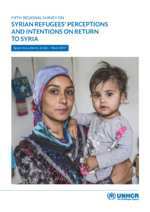 Due to limited resettlement places, and small number of the most vulnerable refugees are submitted by UNHCR for resettlement, including women and children traumatized by war, sick and injured civilians who cannot access adequate healthcare, and other victims who continue to be affected by the crisis. In 2017, resettlement submissions from 3RP countries reduced by 52% compared to 2016 due to limited resettlement places. 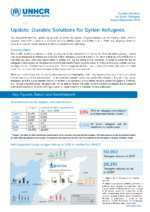 In contrast, the number of registered Syrian refugees increased from 4.8 million (end-2016) to 5.6 million today. The number of refugees meeting resettlement criteria and severity of their vulnerabilities continue to escalate. 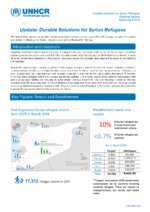 * The numbers reported are only those monitored by UNHCR and do not reflect the entire returns. ** This number includes 5,596 individuals who UNHCR has verified as having spontaneously returned on their own, as well as 8,900 individuals who have been matched against the UNHCR database from the GSO lists of organised group returns. The total number of individuals on lists shared by the GSO in 2018 amounts to 11,133 individuals, and the matching process is ongoing. *** The figures following the re-opening of Jaber border crossing are tentative. UNHCR identifies returns based on departure lists regularly obtained from the Government. Finding solutions that enable refugees to live their lives in dignity and peace is a core part of UNHCR’s work. 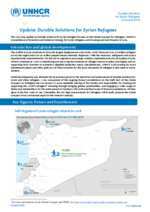 They can include voluntary repatriation, integration, and resettlement and complementary pathways. Here, refugees and asylum-seekers can find information to help them know more about their rights, obligations and the services available to them.